Linaro Ltd, the open source collaborative engineering organization developing software for the Arm® ecosystem, today announced the publication of version 1.0 of 96Boards System-on-Module (SOM) specifications. 96Boards is Linaro’s initiative to build a single software and hardware community across low-cost development boards based on Arm technology. The launch of the new 96Boards specifications means that developers now have a SOM solution which is compatible across SoCs. SOM solutions today use a variety of different connector solutions including SO-DIMM connectors used in DRAM and Mini Module Plus (MMP) connectors for certain specialist boards. Up until now, there has been no solution offering flexible IO and a robust mounting mechanism, nor a standard form factor. The new 96Boards SOM specifications aim to address this lack of choice by producing a general purpose SOM platform that will enable plug and play compatibility between a whole range of different SOM solutions. Today two 96Boards SOM specifications have been launched - the Compute Module Specification and the Wireless Specification. 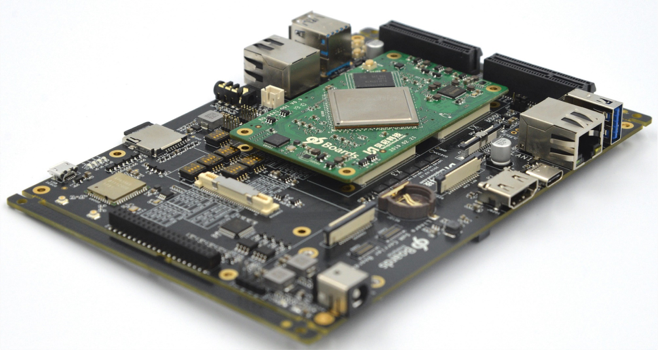 Both specifications encourage the development of reliable and cost-effective embedded platforms for building end-products. The specifications have been proposed, created and reviewed by the current 96Boards Steering Committee Members. The Compute Module Specification defines a SOM with generic module-to-carrier board interface, independent of the specific SoC choice on the module. The Compute module addresses the application requirements of segments including industrial automation, smart devices, gateway systems, automotive, medical, robotics and retail POS systems. Two form factors are defined as SOM-CA and SOM-CB with a maximum of four 100 pin Connectors. The X1 connector is mandatory on all SOMs. The Wireless specification designs a SOM for interchangeable wireless module applications, supporting standard and/or proprietary wireless standards such as 802.15.4, BLE, WiFi, LoRa, NB-IoT, LTE-M etc. The specification is designed to enable evolution that will support multiple products and future wireless standards. The two form factors are defined as SOM-WA/SOM-WB. With the publication of the specifications, Linaro is also launching two 96Boards Compute SOM designs with Rockchip and Beiqicloud - TB-96AI and TB-96AIoT - and a 96Boards SOM Carrier Board. TB-96AI features the latest high-performance AI processing chip RK3399Pro while the TB-96AIoT is equipped with the RK1808 AIoT chip with ultra low power consumption. The 96Boards Compute SOM designs are available for purchase today from Beiqicloud.com. Super Performance Processor: The architecture of Arm dual-core Cortex-A72+quad-core Cortex-A53 is adopted. The main frequency is up to 1.8 GHz and it integrates Mali-T860 MP4 quad-core graphics processor. Ultra-high AI power NPU: Integrating AI Neural Network Processor NPU, supporting 8Bit/16Bit operation, and with computing power of up to 3.0Tops, it can meet various AI application needs such as vision, audio and so on. Powerful Hard Decoding Ability: Supports DP1.2, HDMI 2.0, MIPI-DSI, eDP multiple display output interfaces, dual-screen co-display/dual-screen heterodyne, 4K VP9, 4K 10bits H265/H264 and 1080P multi-format (VC-1, MPEG-1/2/4, VP8) video decoding, 1080P (H.264, VP8 format) video coding. Supports multiple AI frameworks: Compatible with multiple AI frameworks, the design supports TensorFlow Lite/Android NN API, AI software tools support import, mapping and optimization of Caffe / TensorFlow models, allowing developers to easily use AI technology. Equipped with the RK1808 AIoT chip, 22nm process, ultra low power consumption with Independent NPU and AI computing power of up to 3.0Tops, the TB-96AIoT also provides rich interfaces and strong scalability. The 96Boards SOM Carrier Board is compatible with both the TB-96AI and TB-96AIoT. It is designed to suit different markets and demonstrates how easy it is to support multiple different SOMs. Rockchip is China’s leading fabless semiconductor company and has been honored with China Chip Awards twelve times. Since its establishment, Rockchip has been committed to providing technical innovation and prompt support to fuel successful growth for customers. Being a pioneering IC design company, Rockchip offers comprehensive and professional end-to-end SoC (system-on-chip) for AI, smart voice, IPC, fast charger, tablet, IPTV/OTT-Box, ARM PC, embedded applications, VR, robot, drone, image processor, CVR, Internet of Things (IoT), smart audio products etc. Toybrick, Rockchip’s AI development platform, integrates software and hardware development into one platform. In terms of hardware, Toybrick provides various series of development platforms and reference designs to satisfy different user groups. For software, it offers a stable system, rich development tools, and a series of AI cases and open source communities.